An eclectic farrago of popular music photographs, memorabilia, & research material spanning the Jazz Ages circa 1917 onwards – from New Orleans to Chicago Blues and New York BeBop – into the psyched out Sixties and almost beyond Punk Rock 1976 ………….or thereabouts. 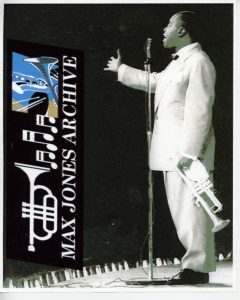 Official Web Site of The Max Jones Archive. Max Jones Archive Copyright © MMXVI. All Rights Reserved.